NOTE: The communications manager for the American Board of Surgery responded to the post below with an assurance that the leave policy for medical or maternity has not changed. The quotation below was sent to program directors yesterday which lead to the misinterpretation. I decided not to delete the entire post however because I think it still brings up relevant points about leave during residency. I apologize for any problems caused by the post but I am happy that the issue has been cleared up. Now this is an amendment to the previous rules that allowed 46 weeks in some years for different reasons - illness, maternity leave, etc. However, apparently the almost exclusively male American Board of Surgery has decided that in 2011, the most progressive move for them is to make surgical residency even harder for women if they are crazy enough to want to have a family! Seriously! I own my choice to be a surgeon. I love it, I can’t imagine myself doing anything else. But I am also 31 years old, and I own my choice to have kids. I will do both, it is hard but it can be done. Women surgeons are a valuable and necessary asset to the practice of surgery and as a result of biology, many of us who would like to have children have to do it during training. I do not apologize for my desire to both be a surgeon and a mom. I will take my call and operate and do whatever. Is it too much to ask that I be given a remotely appropriate amount of maternity leave while forfeiting my vacation and any travel to meetings. Many residents already take less than 6 weeks of maternity leave just because they may have to fly to interviews and only have 5 or 4 weeks remaining. This new rule will leave women with 2 or 3 weeks of maternity leave. We would never ask a patient to perform the tasks we do 2-3 weeks post op. LEAD BY EXAMPLE! be better, be innovative, be smart, be equitable, be accountable. This is ridiculous. Stop being unrealistic about reality. I will make a great surgeon. So will/do lots of women with kids and people who have to interview for jobs and present at meetings and would also like a week of vacation or who may just once need to stay home with a sick kid so as not to destroy the career of their spouse in order to meet your rules. Grow up ABS. Figure out ways to train surgeons more efficiently. We work 90 hours a week (yes, I said 90, 100, 80, 60 pick your number), we care about our patients, we care about being good surgeons - figure out a way to make that happen with humanity and 2 less weeks. We found ours on craigslist (I know!) about 2-3 weeks before I had to go back to work after having Mel. I loved her. She cleaned, she was loving, and she didn't charge an arm and a leg (although some do.... the first nanny we interviewed, who had no references, wanted to charge $22/hour). Since we didn't have any other kids in daycare, we were able to shield Mel from germs for most of her first year of life. The nanny prepared all the bottles, and washed them after using them. She cleaned our house, which probably saved our marriage. The big con is that when you have a nanny, you're at the mercy of her life. Our nanny couldn't work later than 5. Some nannies call in sick a lot. If she suddenly quit, we would have been screwed. We switched to a family home when Mel was a year old because we needed longer hours than our nanny could provide. A family home is a very small daycare in someone's house, which is (should be) certified. Unlike larger daycares, there are much fewer kids (obviously), they are cheaper, and all the ones I called had no waiting list. The family home we used had six kids aged two and under, and two adults. Mostly the kids played in a small room and there was a little playground in their backyard. I felt Mel was safe there and although she didn't get as much individual attention, she was older now and the socialization was more important, I thought. Kids who don't start daycare till three years or older seem to adjust poorly, in my experience. I thought this was an absolutely perfect environment for a one year old baby, aside from the fact that she was sick almost continuously the first three months at the daycare. And so was I. The other con was that the hours were shorter than a large daycare (8:30AM to 6PM) and they closed for two weeks over the winter holidays. If my husband's hours weren't so flexible, we couldn't have managed it. After Mel outgrew the family home (and we moved), she went to a small local daycare with about 16 kids ranging from babies to age 4. I liked the closer-knit environment and the fact that I knew the name of every single child in the daycare. There were several cons to the small daycare. First, the hours were again fairly short (8 to 5:30). Second, we had to prepare all of Mel's lunches (mostly mac and cheese). Third, we were at the mercy of the owner's personal life.... she closed down for three weeks every summer to take a vacation, leaving me to scramble for alternate childcare. I had mixed feelings about the environment of babies along with older kids. It was nice for Mel, who likes babies. But for the babies, I worried about their safety when exposed to toddlers. And of course, there's tremendous potential for germs. A year ago, Mel started a large daycare, run by a faceless company. OK, something about the fact that the teachers are constantly holding a large checklist of all the kids doesn't make me feel all warm and fuzzy, but there are definitely benefits to the large daycare. The hours are fantastic... occasionally, I've felt a bit of time pressure, but honestly, it would be pretty bad if I couldn't get to my kids by 6:30 every evening. They pretty much never close, even for blizzards. They provide lunches devised by a nutritionist. And Mel seems to really love it there. For an older kid, it's not even that expensive. "I pledge alloogin to the flag, and to the 'public, al Obama and Erica." A month ago, we started Baby Lem in the same daycare that Mel attends. It's expensive for a baby, and I had my reservations, to be honest. I wanted her to have the same individual attention that Mel had as a baby. Also, I have to label and prepare all her bottles every morning at home and must bring home anything that is unused at the end of the day, which makes me feel like I'm running some kind of chemistry lab. So far, I have not been unhappy though. Lem is kind of chill in personality, so she's tolerating the environment well. Also, because it's such a large daycare, they have a "baby room" with seven infants and two teachers, and she has her own assigned crib. They're very careful about hygiene: they use plastic gloves when they change diapers, and they don't allow shoes (or toddlers) in the baby room. Every time I come to pick her up, Lem is being held, and there have been only a few times that I've found her crying unattended. And now that we have two kids, I know it's impossible to shield her from germs. I'm not sure if I would have chosen them if Mel wasn't already going there, but I don't feel like it's a bad choice. So that, in a nutshell, is our experience with childcare. Questions, comments? Why do I have so much clothing?? 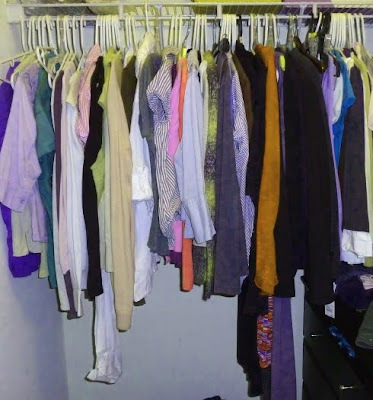 As my husband frequently asks, why do I have so many clothes?? And this doesn't even include all my pants (I have an entire dresser of pants) and non-work shirts. I never buy clothes. OK, I did recently buy maternity clothes, but I didn't have much choice in the matter unless I wanted to come to work with my stomach exposed. But I've gotten rid of those clothes and look how much I still have! Despite the fact that I feel like I wear the same 5-6 shirts over and over. 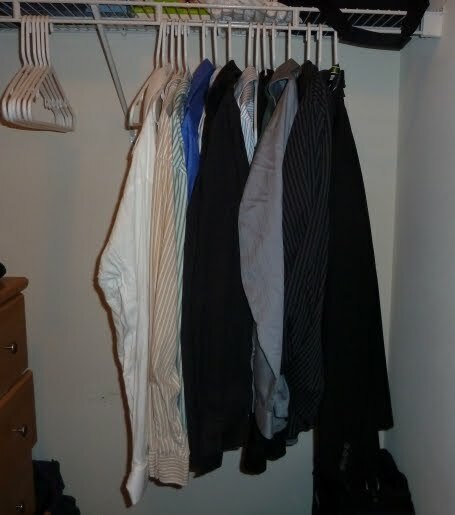 And worse, every morning I stare into the closet and think to myself that I have nothing to wear. I seriously do that. So that requires me to have twice as many clothes. But I suspect the bigger problem is that I can't ever bring myself to throw anything out. I save shirts until they're just about falling apart at the seams because maybe I'll want to wear them again. Or I save shirts that I hate (usually gifts) because I never wore them and I can't bear to get rid of something that's basically brand new. Or maybe one day I'll lose a lot of weight and be able to wear those pants again. It could happen!! I know I've got to go through my closet and make some hard choices. I just can't seem to bring myself to do it. I've been thinking about posting on this for a bit. Aliases, noms de plume, alter egos. We all have them for some reason. When I started blogging as Gizabeth Shyder back in the fall of 2008, it was primarily out of fear. Fear of failing, fear of exposing my kids online. I was in a bad marriage and it was just a hell of a lot easier, and more comfortable, to be out there as another person. My real self, shrouded in a name I stole from a geek at Best Buy that set up my new laptop as Gizabeth Scheider. I thought the "y" was a lot cooler. I thought the name was much more interesting than my own. My kids were initially John and Sicily, but have since been changed to their real names, Jack and Cecelia (or Ce-silly, as she prefers to be called). Within a few months of blogging I was written up in a local medical news rag. I let them use my real name, and answered something like this when I was asked about blogging under a pseudonym. "You are never really anonymous on the web, and I think it is dangerous to think that you are." I believe this wholeheartedly. A recent comment thread on MiM got me thinking anew about aliases. I have no real judgment about them, unless they are used to talk negatively and scorn patients. Embarrassingly, I have followed some of these blogs, kind of like rubbernecking. I don't always approve but am sometimes entertained. As far as the comment threads, someone I love railed on an anonymous commenter who was full of negativity, recently. The commenter wrote back - basically asking what the heck is different about anonymity and having a pseudonym. Despite their negativity cloaked in anonymity, I thought what an apt observation. Most of us on MiM are more comfortable writing under pseudonyms, using cute/false names for our kids, and I have never felt that uncomfortable feeling I do when I read about doctors judging patients here. These women are all pretty high quality. The fact that they choose anonymity doesn't detract from their posts, and I see that many choose it for different reasons, some similar to my original ones, some different. I write about this in hopes of sparking a conversation about aliases. Opinions, and people's reasons for using them. Some women, like Michelle Au who I interviewed this summer, are completely kosher with using their real name (If I had a name as cool as Michelle Au - I would be sharing and spreading all over the web). But many other women are not. I personally see no problem with going either way, as long as you stay within the lines. By that I mean adhere to ethics, as each of us hopefully learned from our parents, and if not picked up in medical school. What do you think? When I was a resident on ICU, the staff physician mentioned that his mother needed an ultrasound. He asked the radiologist what the waiting list was like. This was in Montreal, so the answer was something along the lines of "Bad. Who's it for?" "Oh, your mother! I'll squeeze her in." "No, that's all right. We can wait our turn like everyone else." I felt ambivalent, hearing this story. On one hand, I support a one-tier, publicly funded medical system, which is not the majority view among my more verbal friends. On the other hand, I think that if I can assist one of my colleagues in any way, I will do it. Our health care system is so tight and this is one of the last ways we can make it more pleasant for someone ill. This comes up in the emergency room all the time, of course. I will see a nurse's relative, for example, ahead of the waiting throng, and usually, at my hospitals, this is not such a big deal. We don't have the 14 hour waits. But one day I saw several people ahead of time and I felt uncomfortable about it. Meanwhile, I kept trucking along until, at 19 weeks of pregnancy, I passed some blood clots. I woke my husband up and said, "I think I'll go use the bedside ultrasound in emerg. If the baby's okay, I can still make my appointment Montreal." Bedside ultrasound takes approximately zero skill after ten weeks of pregnancy, just to check on the baby. I felt the baby roll—or was that the beginning of a cramp? After a minute, I felt a kick. And then two more. But then I remembered more about second trimester bleeding. I woke Matt up again. "I have to get a real ultrasound. In first trimester bleeding, you want to know if the baby is alive. But in second trimester, you have to start looking at the placenta. If it's a placenta previa or an abruptio placenta..." My bleeding was painless. Therefore more likely a previa. Ultrasound was not always diagnostic, but it would definitely help. Me sticking an ultrasound wand on top of my belly was not going to help. I couldn't tell you whether there was a bleed or not. "You may end up on six months of bedrest," said Matt. I waited the marginally civilized hour of 6 a.m. to call one of my hospitals. The emergency doctor, who is also my friend, said she could arrange the scan. I walked in just over an hour later and the nurse looked at my belly and asked, "Are you still bleeding?" So the word had gotten out. That made it easier for me. I didn't have to explain, just let her take my vitals and breathe in relief when another nurse successfully found the baby's heartbeat with the Doppler. I ended up writing my own ultrasound requisition and paging the tech, who was already with the first patient, but the next slot was free. The emergency doctor talked to the radiologist, who agreed to call me on my cell phone with the results. And pretty much immediately afterward, the ultrasound tech was ready for me. And the baby looked good! The placenta was less than 2 cm from the cervical os, so that probably explained the bleeding. Before lunch, the radiologist called me and said, "The baby looks fine." He wasn't convinced that the placenta was marginal, based on the views he'd seen, but he concluded, "Good news." This is Very Important Medical Person treatment. Scanned two hours after I called, results another two hours after that. Is this right? Should I just meekly line up at the ER and wait my turn with the doctor? By then, it would be too late for the 7:45 a.m. open ultrasound slot, so I'd have to wait and see if a spot opened up later that day. Then I'd wait for the radiologist to read the films in order. Then I'd wait for the ER doc to get the results. I'd wait for him to tell me said results, either before or after he called the ob for an interpretation. I know that's the "right" thing to do, in some people's books. But I don't see the medical system like that. I see it as a resource that I understand and need to maximize. So yes, I could have hung around. But then I'd be one more patient clogging up the system. In and out and we're all happier. I'm not a star. I don't get the red carpet rolled out for me. Paparazzi don't follow me around and sell my photo for thousands of dollars. But when I need medical treatment, I have doctors and nurses who will help me get it as quickly and pleasantly as possible. -From an e-book by Melissa Yuan-Innes "The Most Unfeeling Doctor in the World and Other True Tales From the Emergency Room." We will all go down (and then up again) together. Seeing and hiking the Grand Canyon through the eyes and feet of a 5 and a 7 year old. With husband. Which family member thought which thing? There are lots of large mules with large body parts and large piles of poop. There is vast beauty, and vastness in general. He who notes there is no railing (husband-pediatric-researcher) also notes that there are many death defying curves and rocks and edges and did I mention there is no railing? On the very top rim there may be a railing, but what about on the hike down into the canyon? Nope. No railing on our trail. Mules? Check. Mule poop? Check. Spectacular views? Check. Opportunities to fall to one's death? Check. What, me worried? And yet for some reason I was not. Probably because pediatrician-researcher husband did enough worrying for more than both of us. It was truly awesome, not in the like totally 80's way, but in the I am just a speck in this immensely astounding planetary way. Yes, they could fall over the edge, get heatstroke, dehydrate, burn in the sun, fall over the edge. Holding hands. We will all go down (and then up again) together. Mother: "Are you enjoying the hay ride?" Mother: "No, don't say 'yeah.' It's 'yeS.' Say 'yes.'" Of course, because all parents secretly judge other parents who make parenting decisions that are different from theirs, I thought this woman was being totally ridiculous and wasting her time. If you're going to pick a battle to fight with your kid, I think the yeah vs. yes battle really isn't worth it. "I'm so tired of doing things." So I'm just not sure that with all the other stress in my life, if the toothbrushing battle is worth it. Is this really how I want to spend the few hours I have with Mel between daycare and sleep? Maybe I should just give up. They're just baby teeth, after all. I'm a 27 year old, married mother of one 3.5 year old son and live in Toronto, Canada. I'm not a doctor - I'm not even in medical school. But I want to be. Here is my story and the journey I’ve started on. I've spent the past 5 years of my career feeling trapped and lost. I was doing well in the traditional sense. I got promoted, I passed the required exams for my CA designation (CPA equivalent in the US). I got good performance reviews. But from the moment I accepted my job offer with a Big 4 accounting firm, I have been nagged with a sense of doubt. Am I making a difference? Am I adding value? Is it normal to have a constant feeling of dread when thinking about work? Am I proud of what I do? At first I just ignored these feeling (and yet, even shortly after graduating and accepting my job offer I’d be browsing the medical school pages of various universities, already jealous of all those unknown people who would be starting medical school the same time I’d be starting my job as an audit associate). I reasoned that how can I know that this isn’t what I want to do before I start? Wondered if I was just infatuated with the thought of being a doctor, the way some people wish they could be a Hollywood star? In any case, I was never a quitter and thought I just need to give it time, until I understand more about my profession, until I got to deal with the interesting issues. This is the bed I made; now I should lay in it (and make the best of it). Then one day I was having a chat with a friend of mine who mentioned how her sister-in-law had a similar feeling – she had just graduated from law school and was offered a position with a top law firm, where she had spent her past 3 summers articling. Days before she was due to start, she gave notice and said she was applying to medical school. Fascinated by her story, I thought, hm, maybe I could do this too! I reached out to her to ask her point blanc, if she thought I was crazy. I’m 27, I have child and a mortgage – not to mention nothing in my educational or extracurricular background to indicate any knowledge of medicine. She told me to go for it – that she had people in her medical school class who were older than me, and if this is something that I felt passionate about, I’d make it work. After doing a bit more research, I also realized that I can actually apply to most medical schools in Canada without a science degree. Many require 1 or 2 university level science credits, but many consider the overall applicant and state that people of all educational and professional backgrounds are welcome to apply. Luckily I had very good grades both in high school and university. I’ve also lived in different parts of the world, am fluent in 3 languages and have managed to obtain my CA designation while juggling motherhood and wifedom. So I decided to bite the bullet and try and I’ve officially embarked on this journey. I’ve signed up for a Biology course through an online university to help me get a couple pre-requisite courses that are required by some of the universities. I’ve perused books and blogs that focus on what a career in medicine means. I bought (and started to review) and MCAT study guide. I'm also hoping to negotiate going down to a part-time work schedule so that I can make room for volunteer work and to study. However, as hopeful as I sound, I’m very aware of how hard this will be. How I will undoubtedly question my decision and how I will want to give up. But I also know that I may fail. Even if I do everything I can (take perquisite courses, do some meaningful volunteer work, do well on the MCATs) I may not get selected. I know how incredibly competitive this field is and I may not be the best candidate. But I’m fine with that. This is my dream and I want to try. If I fail, I fail – but at least I won’t have to live with the regret of not trying. I recently read a blog post about whether medicine is a good career for a woman, since you can work part-time to be with your kids and many specialties are very family-friendly. I wasn't thinking about kids when I was 21 and applying to med school, but I was told medicine was a good career for a woman because it is a field where a woman can earn a good living and face less discrimination than in some of the math-oriented fields I was considering. As for being a mother in medicine.... if you had asked me five years ago, I would have said that being in medicine is a horrible idea if you want to be a mother. Now I revise my opinion and say that it's only a horrible idea if you want to be a mother before you turn thirty. But it's still not ideal in that you can't easily reschedule a roster of patients because your kid has a fever, and squeezing in a pumping session can be difficult during a doctor's typically busy day. It got me wondering though: what is the best career for a mother? Because lately, I've met an awful lot of women who have become mothers and given up their jobs. Traditionally, I think teaching has been considered a good job for a woman and therefore mother. But a friend of mine who had a baby and is now quitting her teaching position says otherwise. The pay is low, there is grading and planning work even once you finish teaching, the hours are surprisingly long due to clubs and phone calls to parents and etc, you maybe get one break the whole day, and you can't easily sneak out early for an appointment or a sick kid. Nursing is another "traditionally female" job. But I've heard nurses complain about how it's hard to find time to pump during their shifts and that the hours are too irregular, making daycare or school harder to manage. Like with teaching, if your kid gets sick, they have to scramble to find a replacement so it's not so easy to just stay home. I'm convinced that the best job for a mother is something like actuary or engineer, where you work on projects that don't rely on you showing up at exactly 7 AM every day, and work can usually be put off for a day if something urgent comes up. But strangely enough, these fields don't seem to attract women. This evidenced-based risk score was developed to help predict overextending of Mothers in Medicine. The goal is to prevent burnout, stress, and associated unpleasant psychological states by monitoring weekly risk, and following guidelines for treatment accordingly. Number of dependents = number of children, care-requiring parents, exceptionally ineffective spouses/life partners, very large and needy household pets. For pregnancy, multiply total by factor of 1.5. C = number of times you have to call your cell phone to find out where you put it in the past week. Lu = number of times you are too busy to eat lunch, forget to eat lunch, or accidentally bring a Tupperware with a half ear of corn and half of a large white onion by mistake instead of the lunch you packed the night before. Hypothetically speaking. Na= number of times you have called your children the wrong name in the past week. *for polygamists, add only 0.5 for every successive spouse after primary spouse; for work spouses, add 0.25 each; only spouses/life partners currently living with you for the majority of the week count in full. MRS > 50 = High risk for overextending. Schedule child-free vacation, delegate projects, get a babysitter for a night out, add another spouse/life partner (or increase efficiency of current one), for the love of God say no to new commitments. Wine. MRS 41-50 = Moderate-high risk of overextending. Schedule spa date. Say no to new commitments. Delegate projects. Possibly add another spouse/life partner (or increase efficiency of current one). Adjunct retail therapy. MRS 30-40 = Moderate risk of overextending. Schedule coffee with girlfriend(s). Say no to new commitments. Delegate projects. MRS < 30 = Low risk of overextending. Good job! Offer help to your MiM friends in higher risk categories. n.b. Risk score prognostication has not been scientifically validated.